I was wondering, if it is possible to have a mode, which would change the time the flux lights start? I know that here is a mode called work late, but does not quite do the job. I live in Denmark in the dark north of Europe, where in the winter the sun goes down early. In the winter the sun goes down at 16.30 already, which means flux turns the flux colors on this early. The colors does not quite need to change until a couple of hours before planned bedtime in my opinion. I just think the lights turns to night colors seem way to early at 4.30 pm, where I would still work 5 hours more before i would use the flux colors. So a couple of hours before the mode work late starts with the deep night colors the sunset colors would be nice, but not already late afternoon. As far as I know there is no way to change away from sunset time and use a fixed time as sunset time, I know it does not make sense, but hope you understand. I know it is not useful to a lot of people, but it just bugs me and would be really useful to me. Right now I am adjusting the settings every time I think I would sleep in a couple of hours, but seems kind of annoying to have to do this. hi @boetk, thanks for your request. Are you using Windows? The Mac version has some nice circadian timing that will be coming to the next big Windows release. It does a gradual sunset change and then a big one before bed. I think he's using a Mac or some other non-Windows system because his copy of f.lux has something called "Work Late". So you would like later sunsets or a longer bedtime transition maybe. Neat request. Yeah I'm on a Mac, which might be why I do not have all the fancy modes. Yeah a later sunset would be preferable, but I think I will settle for some mode or feature in flux :P I just thought about it and maybe it would be considered in the future. The point is the sunset mode change is just for long, and the normal colors might wake you slightly after a long day. No, the Windows version has less features and options than the Mac version. If you go to the root of this forum, by clicking the uh, the big "f.lux forum" in the top left, you'll see "F.lux Tech Support" and there is a section for Windows, Mac, Linux, and iOS. This section is just for the cool fluxometer, which is a graph that shows color spectrum of over 100 different light sources! Yeah, I have to admit that it's getting a little bit annoying that threads keep showing up in the f.luxometer forum when they have absolutely nothing to do with it. Don't make another thread though. It's not worth it. @lorna in northern European countries but also in Canada, the daylight hours aren't always a good indicator when to dim the colours. In the winter a working day starts and ends in the dark. In the summer nights are shorter than 8 hours and f.lux will not dim before it's time to sleep. @Jasha-Joachimsthal So... you want it to start the sunset sooner, then switch to bedtime? What presets / modes (classic f.lux mode, work late mode, etc) are you using now, and could you describe a little more what you would like to be different please? Hi, just to second that it would be great to have an 'adjustable' sunset or a configurable no. hours after sunset to start dimming - in the UK, sunset is currently 4pm but I'd typically like to remain working with normal colours until at least 5 or 6. I completely agree with this. I live in Canada and right now the sun sets at around 4:30PM. I don't start getting ready for bed until at least 10PM so I would love it if I could set a custom time for the transition to start at instead of it going with the sun. I guess I could set the location to somewhere at the equator so the day lasts longer but I would prefer if I could just set a custom time. Just going to chime in here and add my request for a feature that will allow extended daylight hours. I also live in Canada, and the sun goes down before I leave the office. I work in graphic design where color is important, so I'd prefer if there was a way to postpone the flux "sunset" so it didn't happen as soon as the sun goes down. 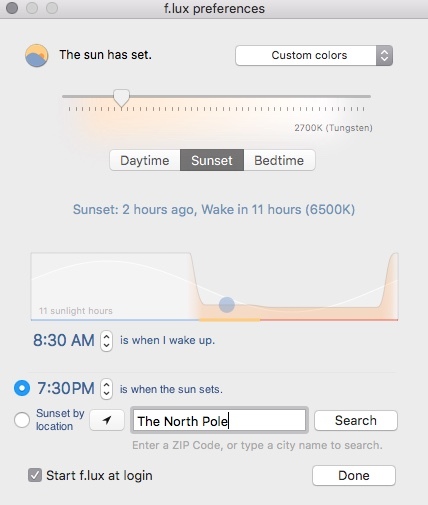 I'm not sure what the best option would be, but being able to set a custom sunset and bed time would be awesome! This is a "frequently asked question", and I think the f.lux team has some ideas about it. In the meantime, just set your location to somewhere in the south. The closer to the Equator you get, the more stable the sunset time will be. You can adjust what time it happens by moving farther east or west. For example, if you live in Denmark, I hear that Lolodorf in Cameroon is a lovely place to move your circadian rhythms to. Love the name, anyway. What I do in the winter is simulate a longer daytime with bright daylight-coloured lights. I think it helps prevent "the winter blues". I turn them off around 7pm, and use less bright tungsten coloured lights. Then an hour or two before bed, I turn those off too, and just have a small lamp with Rosco orange gel over it, which is close to the 1900K bedtime colour. Probably most people in the North do something similar - when it's 3pm and already dark, naturally you turn on a bunch of lights - we aren't living in caves anymore! But in the evening, they start to get dimmed or turned off, and a warmer colour feels more natural. Using f.lux probably makes people more aware that they should consider dimming/warming the lights even more, as the day winds down. I've got f.lux to follow along - actually, it usually reminds me to change my lighting - by setting my location closer to the equator. So my screen colour more or less matches my lighting environment. It took some slightly annoying trial-and-error to get the right location, but now that I've got it set, I actually like that my "virtual sunset" does change a bit with the season - just not so extreme - rather than being always at 7pm. But I think most people would be happy to choose a fixed sunset time that corresponds with their working hours and so on, even if it has to be adjusted a few times a year. I guess the bottom line is that it would be nice to have a more straightforward way of choosing a sunset time for f.lux that matches what people in the North simulate with electric lighting or curtains. Other than that, we're just normal people! Just a suggestion - something like this maybe? Yes we'll look into this some more - sounds like for sure there is something you're doing in between "sun is down" and "getting ready for bed" more like the 12-12 equinox schedule. "Then an hour or two before bed, I turn those off too, and just have a small lamp with Rosco orange gel over it, which is close to the 1900K bedtime colour." I'd seriously like to see this lamp!! I'd say the easiest way to upload would be Imgur. @lorna Wow I really like that! I may have to get a few bits and pieces of it. Cool, I clicked "About Us" and they have areas to ship from TX, which is about as far west as I'll go when getting stuff shipped to me. I like it because it's a central location and it's fair for most people, and well, great stuff comes from Texas! @timpster it's just a little Ikea lamp with a normal 4W warm LED bulb. I taped a piece of Rosco gel around it, very low-tech! You should be able to buy sheets of Roso or Lee gel filters in local camera stores, or places that sell DJ or theatre lights. Should be US $5-10 for a good sized piece. @Elhem-Enohpi Cool, very energy efficient!